Or view larger version. 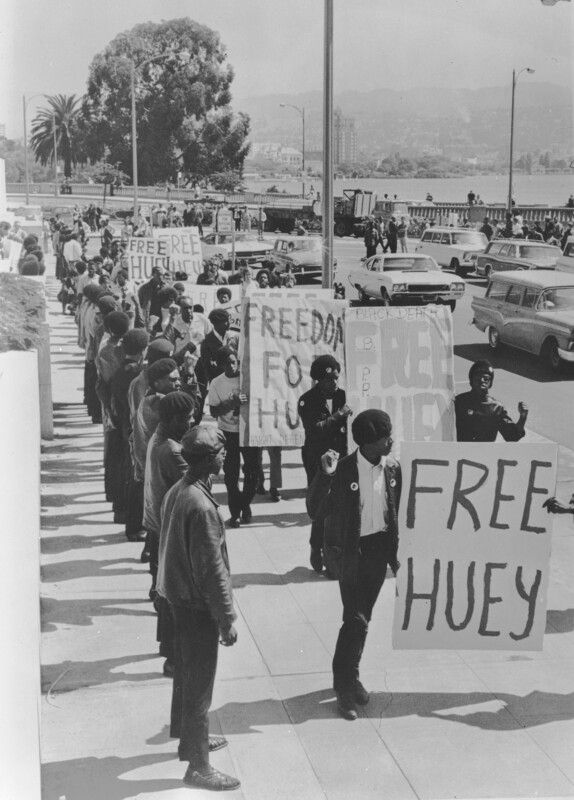 Members of the Black Panthers march outside of the Alameda County Courthouse in Oakland during Huey Newton's trial. July 17, 1968. Keith Dennison, photographer. Gelatin silver print. Collection of Oakland Museum of California. The Oakland Tribune Collection. Gift of ANG Newspapers. In this 1968 photograph, 400 members of the Black Panthers march outside of the Alameda County Courthouse in Oakland during Huey Newton's trial for the murder of an Oakland police officer. Other radical groups that advocated revolutionary change included Tom Hayden's Students for a Democratic Society (SDS), the Weather Underground, and The Youth International Party (Yippies). Black Panther co-founder Bobby Seale was arrested along with Yippie cofounders Hoffman and Rubin for inciting riots at the 1968 Democratic National Convention in Chicago. The trial's subjects later became known as "the Chicago Seven."